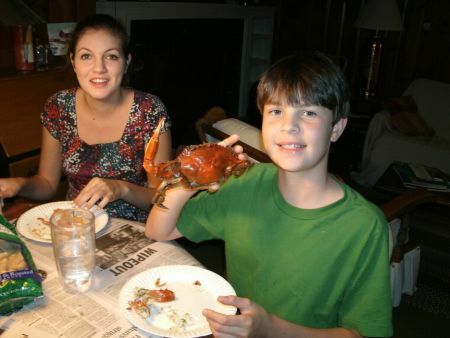 Catching and cooking blue crabs, fresh and feisty from our Cape Cod waters, is one of our family's favorite ways to have a simple, delicious summer meal! 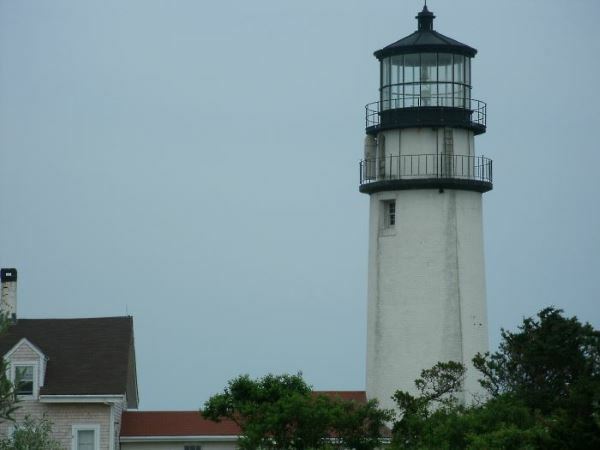 And talk about inexpensive ... Atlantic blue crabs are free for the catching on Cape Cod. 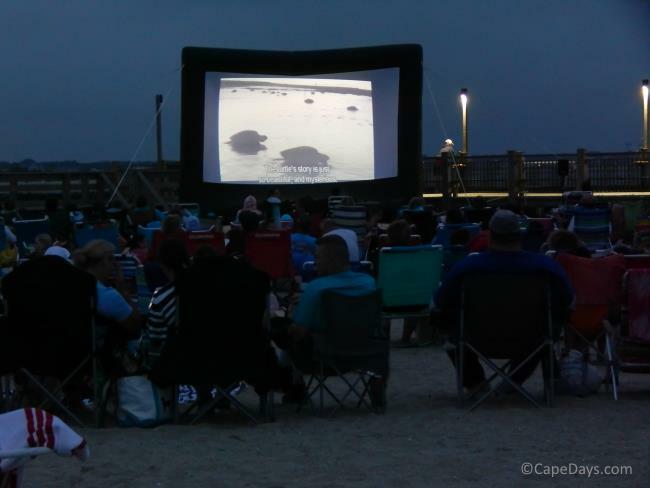 All you'll need for your own yummy crab-fest is some basic crabbing equipment, a little crab-catching talent, and a stove or campfire where you can boil up a big pot of water. Blue crabs are super-simple to prepare. In about 20 minutes, they go from pot to plate. Couldn't be easier! There's only one thing about cooking blue crab that can pose a bit of a challenge. That's moving the little devils from their storage container into the pot, while their claws are trying to fend you off. 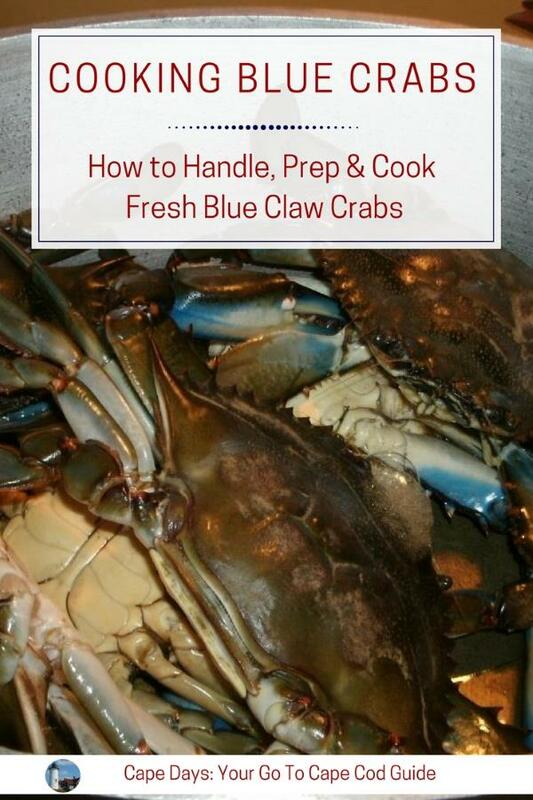 Rule #1 of Handling a Blue Crab: Keep your fingers away from theirs! A blue crab's claws are strong. They're sharp, too. And crabs are incredibly tenacious. Once they latch on, they're not quick to let go. Thankfully, that's not my thumb in the clutches of that crab claw. I learned years ago (yes, through trial and very painful error!) 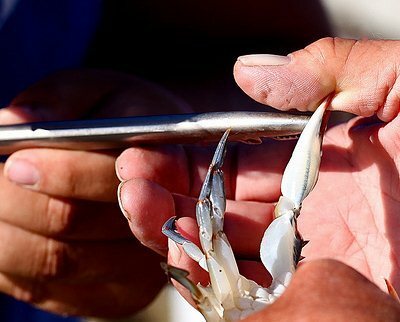 that the safest way to handle a live blue crab is from a distance - with a set of long-handled barbecue tongs. Wieldling my tongs, I grab the crab from behind, top and bottom of the shell, claws pointing away from me. Then I'm the boss! Other than rinsing them off, there's not much else you need to do. 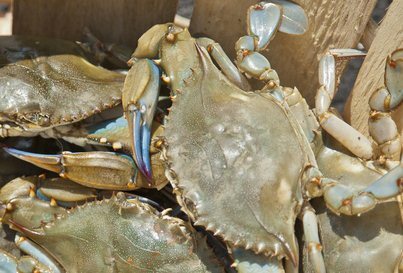 If you've purchased your blue claw crabs from a seafood market, they should be nice and clean already. Just give them a good rinse with your garden hose or kitchen sink sprayer. That's usually enough to remove any lingering seaweed or gunk. You can go the extra step and use a scrub brush on their shells, if you'd like. I don't usually bother doing that, but it's up to you! When it comes to cooking fresh-caught blue crabs, I'm definitely a purist. Nothing goes into our cooking pot except water and the live crabs. Some folks like to add other stuff to the pot - a little vinegar, a cup of beer, or maybe some "crab boil" spices like Old Bay Seasoning. Not in my kitchen - no way! The taste of blue crab meat is sooooo sweet just as it is. I can't imagine why anyone would want to alter that flavor! Put an couple inches of water into a big, sturdy pot. Cover the pot, put it on the stove or over a hot campfire, and bring the water to a rolling boil. When the water is boiling, drop your crabs into the pot. Be sure not to pack them in too tightly. Put the lid back on the pot, and continue to cook over high heat for about 20 minutes. Your crabs' shells will be bright orange when they're ready to eat. Spread newspaper across your table for easy clean up, melt some butter for dipping, and enjoy! I'm a total woosie when it comes to putting live crabs, live lobsters, or live anything, into a pot of boiling water. That's why my hubby usually gets to do the job ... while I hide out in another room until the dastardly deed is done. On those rare occasions when I have to pot 'em up myself, I prefer to put my live crabs "to sleep" before dropping them in the cooker. A few minutes in a bowl of ice water puts live crabs into a dormant state, making their ultimate demise a bit less harrowing for all involved. Want to keep your crabs alive overnight and cook 'em tomorrow? It's easy. Just kept them damp and cool - but don't submerge them in a bucket of water! When crabs are left in standing water for more than a few minutes, they use up all the available oxygen and die. And when they die, the meat quickly starts to spoil. "Bad" crabmeat can make you very sick. Don't risk it! 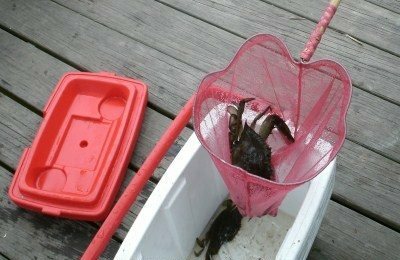 Line an old wooden crate with damp burlap, put your crabs in the crate, and cover them with more damp burlap. Store the crate in a cool, shady spot, and keep the burlap damp. Use an old ice chest or cooler - the kind that has a drain plug. Put a layer of ice in the bottom of the chest/cooler. Add a layer of damp burlap or newspaper over the ice. Place the crabs on top of the burlap/newspaper. Cover the crabs with another layer of damp burlap/newspaper. Add a little more ice on top. Be sure to remove the drain plug so the melt water can escape, and leave the top of the chest/cooler slightly ajar to allow for a little air circulation. Store in a cool, shady place. 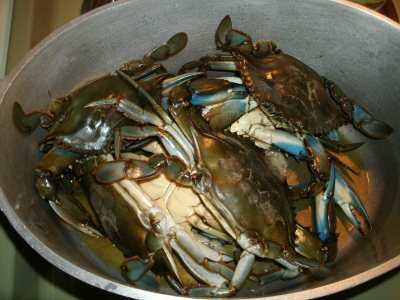 Put the live crabs in a wet paper bag, and pop the bag into the refrigerator. Keep the bag damp until cooking time. Stored properly, your crabs should stay alive for at least 12 to 24 hours. You've cooked 'em. Now it's time to dive in and gobble up the sweet, succulent crabmeat! So, how do you get to all that yummy meat? Use these handy shell crackers and meat-picking forks. They're a go-to at our house for digging out every precious bite! 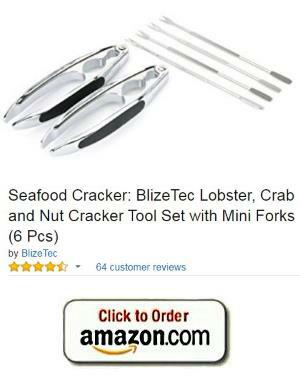 Click here to order your crab-eating tools now!